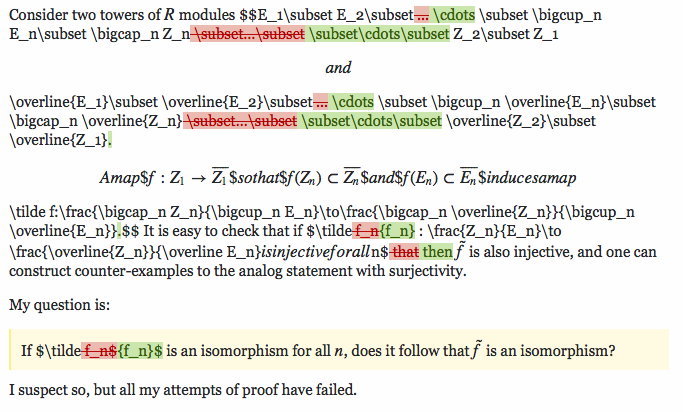 Sometimes if somebody edits the MathJax part of a question or answer MathJax breaks down in the revision history, creating italics and messing up formatting so that its really hard to see what changed. An example follows, here one can still tell what changed (which is not always the case) but it is messy (like the and that is somehow its own paragraph right in the middle). The problem is caused by the green and red highlighting, if you look closely, you can see $'s in them. These $ aren't counted properly as MathJax, and therefor, the whole rendering breaks down. Not the answer you're looking for? Browse other questions tagged bug status-completed mathjax edit-history .